In an earlier post I suggested that subjects such as history and computer science might like to know more about how future initial teacher training (ITT) will look. This is on the back of a project I’m undertaking on the future shape of ITT in chemistry. The National Association for the Teaching of English (NATE) undertook a survey of its members recently about the training of teachers. The results have been summarised in a position paper. One diagram in it (see below) shows the response from more than 700 current and former teaching professionals to a question about the perceived effectiveness of the Government’s new School Direct teacher training route. Surveying the Wreckage. NATE, 2013. 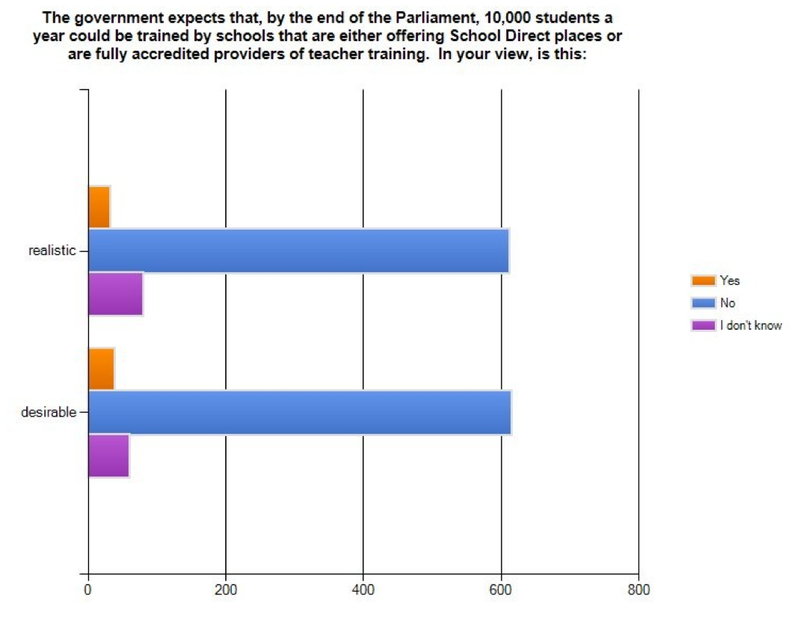 This showed that by far the majority of those who replied did not think it realistic or desirable that the Government is aiming to recruit 10,000 new teacher trainees by 2015 by providing direct places in schools, as opposed to training colleges. Of course we will only really know from an evidence-informed post hoc evaluation, by which time some would say it might be too late. As it happens NATE has referenced its report as part of evidence to an ongoing inquiry by the House of Commons Education Select Committee into ‘Great Teachers – follow up’. It will be interesting to see how the inquiry progresses when MPs return to Westminster in the Autumn and are faced with the latest statistics on the potential shortfall of trainees starting in a range of subjects.